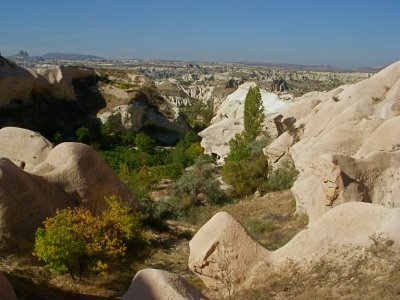 The Red & Rose Valley—Cappadoica. 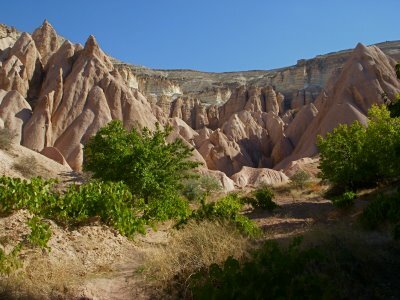 Being based in Cavusin is ideal for trekking around the different valleys of Cappadoica. 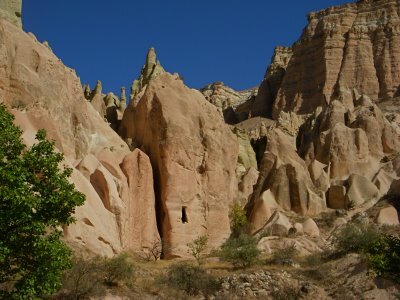 Today I hiked around the Rose, Red, and the Kizilcukur Valleys. There were very few tourists, I did not run into any in the first two hours. These valleys are spectacular and diverse in color. I found some spots that created echos—my pocket Native American Flute is the ticket, the atmosphere of the moment was perfect to play that echoed down into the valleys. What a fantastic sound that the valleys provided, ideal for a flute playing. I do desire a flute in the key of B or C, although I don’t know if I would want to continually carry it around. When I left Beirut I had to much in my pack, I did give a few things away and now my pack at a good weight. I took about 200 pictures during the four hour hike around three different valleys. Some of the climbing was slightly difficult, although I am in much better shape from the time of climbing Mount Sinai in Egypt. The Red Wing Walking shoes I bought before I left America have held up extremely well, I have gotten use to them trekking on the trails, they are made for pavement, though. 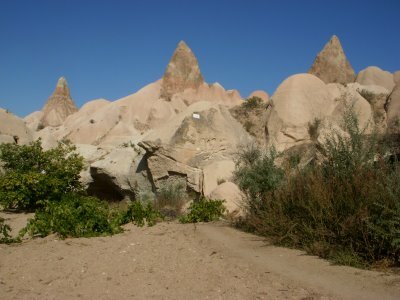 Cappadoica was an important and strategic region for trade from every direction. 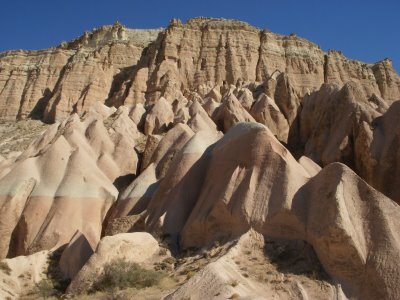 Cappadoica was located on the silk road. The trade resources caused the region to be invaded and looted from time to time. This is one reason that people lived within the rocks and caves built into caverns and grottos. Strategically they concealed the entrances from would-be thieves. Slowing subterranean cities were created that included sources of water, temples, and food storage that date before the Byzantine era. The place I am staying in Cavuisn is quite comfortable and the best part there is no tourists, I am the only one here, there was a group from Holland the day I arrived, although they moved to their next destination. 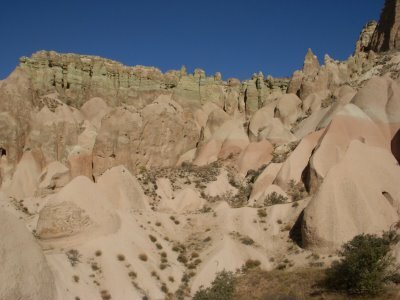 A group from France is biking around Cappadocia just arrived and they are staying one night. 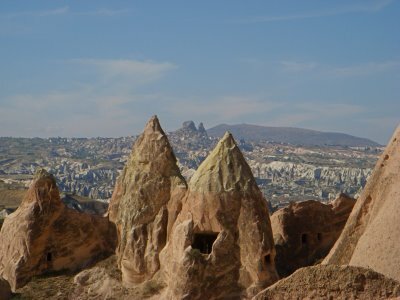 I went into Goreme to get a sense of the energy which is in the center of Cappadocia and I will not be staying there. The town reminds me of Dahab, and where I am at my travels I don’t need that type of stress from a touristic town. From my experience the energy and mentality of the locals is different in towns that position their business on tourism. Every place I have visited that receive mass tourism is effected in a strange manner. I will stay here in Cavuisn at least two more nights. 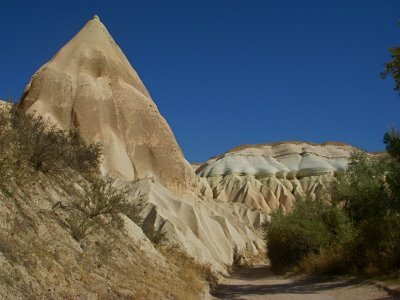 Possibly I will go to Uchisar for a couple of nights afterward. 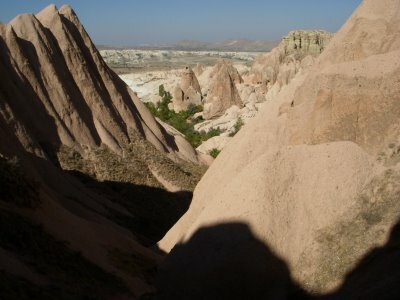 I will have pictures posted on shutterfly soon, I think I will make a separate album for Cappadocia. Next post: Ailanpa Cafe & Wine House.